Stamps; Clear Rubber Stamp Sentiment (lost packaging so brand unknown), sorry. Accessories; Creative Expressions dies by Sue Wilson; Scandinavian Corner Border and Tag (used on sentiment panel), Scandinavian Collection Copenhagen mini oval (houses the Bday sentiment), Gemini Dies-Phoenix Border die (holds the antique rhinestone flower perfectly), New York Collection Herald Square Die (for pink polkadot panel behind the black square), New York Collection- Union Square die (for black square panel), Antique Floral Rhinestone Brad, Satin Ribbon, mini-adhesive clear Rhinestones, Cosmic Shimmer Glitter Glue, Glitter. Thanks for stopping. I hope to have inspired you and wish you loads of HAPPY Creative moments throughout 2015! Don't forget to stop by the adorable HMFMC Blog this week for fun, prizes, surprises and the very first House-Mouse challenge of 2015! 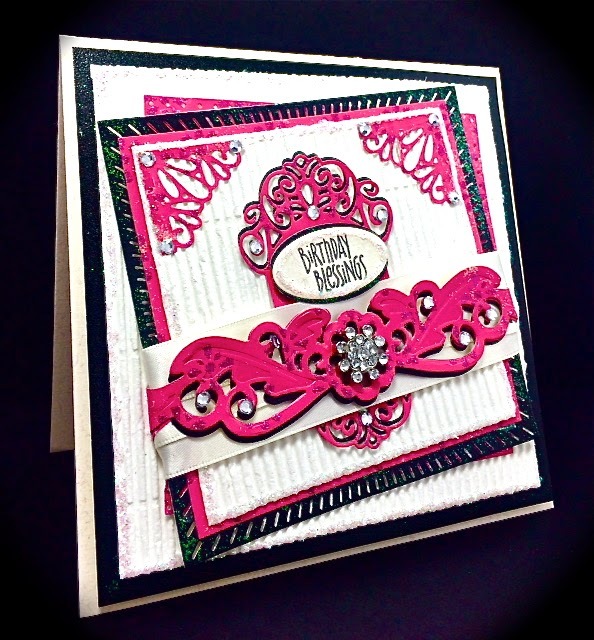 I LOVE so much your card and all the Creative Expression's dies, they are really gorgous!! Thanks for the informations to found Sue Wilson's dies in UK, I'm in Italy and here there aren't! it's elegant and gorgeous America.